Director/Producer – Richard Franklin, Screenplay – Everett de Roche, Story – Tom Ackerman & Lee David Zlotoff, Photography – Mike Molloy, Music – Jerry Goldsmith, Special Effects – John Gant, Prosthetics – Lyle Conway, Production Design – Norman Garwood. Production Company – Universal/EMI. Jane Chase, an American student studying at the London Institute of Sciences, accepts a live-in holiday job as housekeeper for anthropology professor Steven Philip at his house on the remote Cornish coast. She is amazed by Phillip’s chimpanzees Link, Voodoo and Imp, which have been trained to a high level of behaviour, such that they have the ability to understand and communicate with humans. Phillip then mysteriously vanishes, leaving Jane alone in the house with Link whose behaviour has become increasingly more menacing. Link was one of the films from Australia’s Richard Franklin. For a time in the mid-1980s, Franklin seemed a promising genre director. He had trained under Alfred Hitchcock, made a couple of softcore comedies and then emerged with intelligent genre films such as the Carrie (1976)-clone Patrick (1978) and the excellent psychological thriller Roadgames (1981), before bursting onto the international stage with the surprisingly good Psycho II (1983). Franklin failed to subsequently follow up on the promise of Psycho II, delivering the likes of the confused children’s film Cloak and Dagger (1984), this, and then the dire FX 2 (1991), all of which met with indifferent reception. 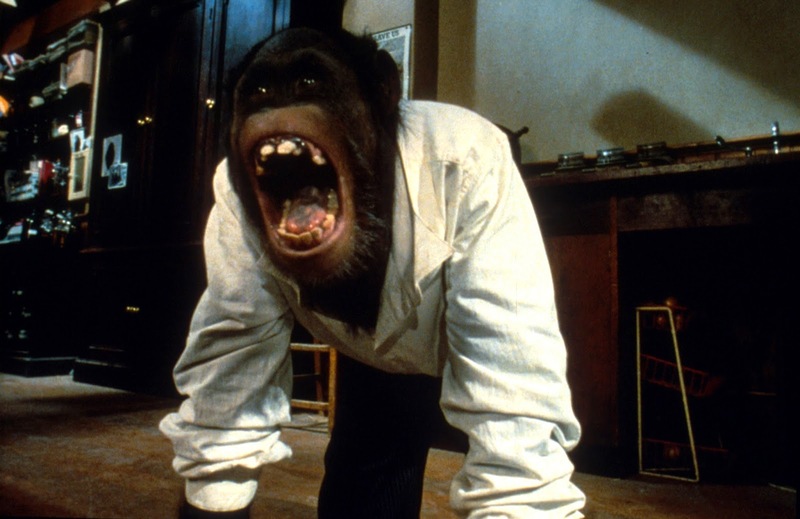 In the 1990s, Franklin returned to Australia and mostly worked in tv until his death in 2007, where he made intelligent non-genre fare such as Hotel Sorrento (1995) and Brilliant Lies (1996), before making a return to genre material with the fine ghost story Visitors (2003). Link was also co-written with Everett De Roche, a veteran Australian screenwriter and writer of all of Richard Franklin’s other Australian genre films (see below for De Roche’s other films). Yet, for all the anthropological realism brought to bear, Link is still just a killer ape film. When it gets down to it, the film never offers any explanation as to why Link is menacing Elisabeth Shue. There is a hint of an explanation offered in the tape recording but nothing is made clear. Despite the talent arrayed, they don’t get the story set-up right either. The film never gets into gear for the first three-quarters. This lack of cohesion is displayed in the film’s almost criminally indifferent dispatch of a fine actor like Terence Stamp without any explanation about a third of the way in. Richard Franklin certainly gains his feet in the last quarter of the film and offers a suitably tense series of shock effects – there is one great moment where David O’Hara investigates a rattling letter slot in a doorway only to get his arm wrenched off. The scenes with Link pursuing Elisabeth Shue through the house, spying on her as she bathes and trying to push her over the cliff in a freewheeling van, are well sustained. The chimp Link has an incredibly sinister expressiveness in its sleekly beautiful face and blankly luxuriant eyes. Jerry Goldsmith manages an appropriately anthropological score, mixing native African rhythms with electronic percussion and a classical score. The film headlines Elisabeth Shue, who was then 23-years-old but still receiving teenage girl parts and had yet to emerge as the Academy Award-nominated actress she did a few years later. Screenwriter Everett de Roche has written a number of other Australian genre films including the excellent Nature’s Revenge film Long Weekend (1978), the stalker psycho-thriller Snapshot/The Day After Halloween (1979), Harlequin (1980) about an enigmatic magician, Russell Mulcahy’s killer boar saga Razorback (1984), the Aboriginal children’s fantasy Frog Dreaming/The Quest (1986), the psycho-thriller Heart of Midnight (1988), the Backwoods Brutality film Storm Warning (2007), the remake of Long Weekend (2008) and Nine Miles Down (2009) about a mineshaft to Hell.